Silly me. 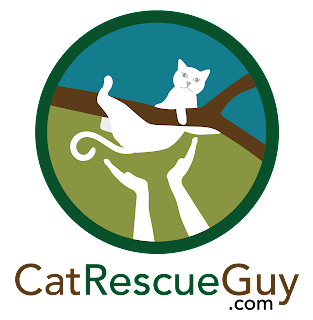 When I got the call to rescue Nunu, a super sweet and friendly 6-month old gray tabby girl, I thought this would be an easy rescue. Little did I know that she was not going to let me get close enough to see just how sweet she is. While this was by no means one of the most difficult rescues I have done, she certainly did make it much harder than it needed to be. Nunu originally came to her family when they rescued her from a tree during a terrible storm. She was low enough that they could reach her with a ladder, and once they brought her down to the ground, they also brought her into their hearts. 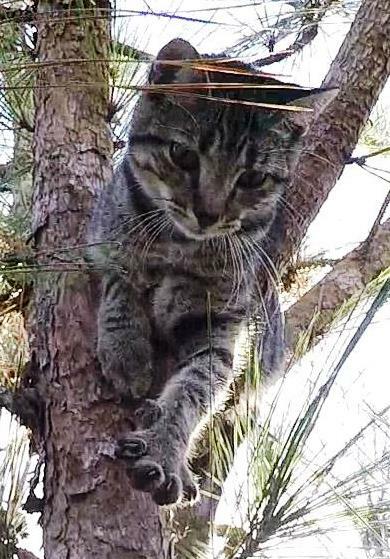 Now, she was in a tree once again, but this time she was out of the reach of their ladder. 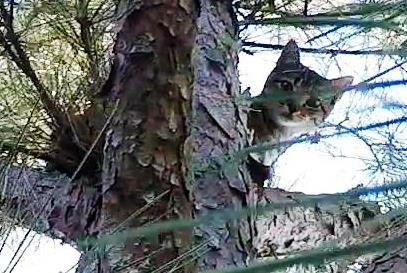 When I arrived, I found her about 40 feet high in a pine tree in the side yard. I did not have a good enough view of the branches above her to set my ropes there, so instead, I installed my rope on a branch about ten feet below her and planned to work my way up to her. She was not frightened by the commotion I made when I installed my rope in the tree and seemed to be pretty calm. This was a good sign, but when I started climbing up toward her, I could see the concern on her face growing as I got closer to her. When I reached a point about six feet below her, she moved upward a few more branches. When I advanced a few more branches, she advanced as well, always staying at least 6 feet above me. Every time I stopped climbing and looked upward, she was in a higher place. 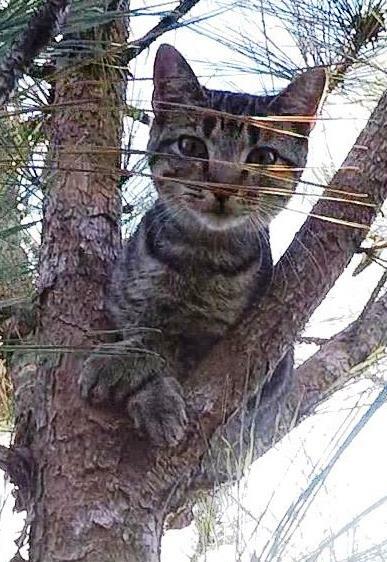 I did not want to chase her all the way to the top of the tree, so I decided to offer her some food in the hope that she would see me in a more friendly light. While she did not eat any of the food, she certainly wasn't afraid of it and gave it a good sniffing. While I don't know if that helped change her opinion of me or not, shortly after that I was able to get close enough to her to allow her to sniff my hand. There is something about the sniff of the hand that seems to ease the fear in a cat. With that introduction out of the way, she now allowed me to touch her and was very comfortable with the petting I gave her. When I reached my hand up to her, she would lower her paw down to me. Now I was finally seeing her sweet side, and I was relieved to know that now I would be able to scruff her into a bag. But by this time, she had led me to the top of the tree, and I still need to get just a little higher to scruff her securely. She was resting about 60 feet high and was in the topmost usable crotch of the tree where I needed to position my rope. I reached up and gently pushed the rope beside her and around the tree being careful not to scare or dislodge her. She handled that well and even seemed to want to play with the rope. 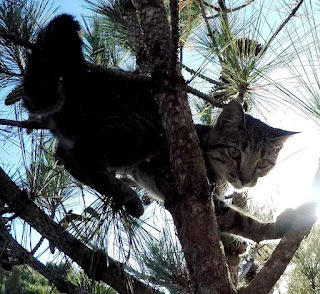 After I lowered my head to attach myself to the rope and pull myself up a little bit, I raised my head and was shocked to see that she had climbed to the extreme top of the tree on the last crotch of new, thin branches. She was in dangerous territory now. I pulled myself up as high as I could go and was relieved to see that I could still reach her as long as she would lower herself to me just a bit. She had wrapped her body around the topmost section of the stem, and I needed to get her back on the closer side so that I would be able to pull her out without her grabbing all the branches. I coaxed her into turning back around toward me, but then I was horrified to see her reaching up as if to climb higher. I put my hand down low and got her attention. Fortunately, she came back down and lowered her head down to my hand. I petted her just a bit and quickly scruffed her. I was not going to give her another chance to make this worse. When I pulled her out of the tree, she grabbed all the branches she could and let out a cry, but otherwise, she did not struggle with it. After I pried her last paw off the branch, I pulled the bag over her and secured her. Her soft cries of displeasure and betrayal while in the bag were pitiful to hear, but I was so relieved to finally have her secured and ready to go down.